Are you a beginning Chinese language learner who is tired of using traditional textbooks? Are you trying to find fun and interesting content that is targeted at your current level? Are you looking to simply read MORE Chinese? If you said yes to any of the above, we hope you’ll be happy to learn that a new series of guided readers, a project between Mandarin Companion and AllSet Learning, has now been promoted to “textbook status” on Skritter! Mandarin Companion was created by Jared Turner and John Pasden in Shanghai, China and aims to help increase the number of suitable reading materials written for beginning and intermediate language learners. You can read more about the project on the About page. Unlike many other intro-readers on the market, Mandarin Companion drew their inspiration from western classics, and made them their own by creating entirely new characters. 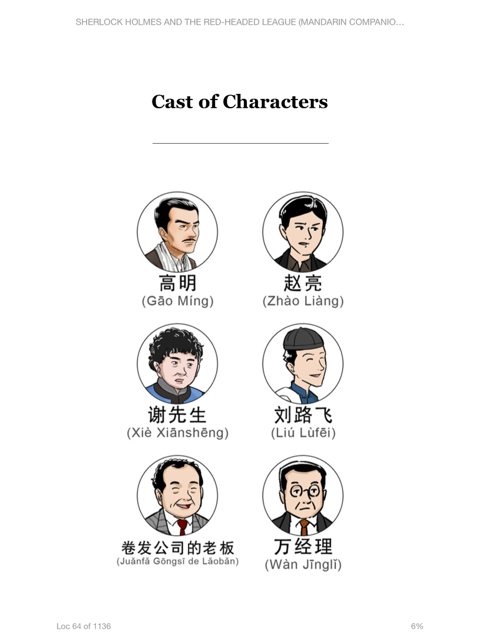 Just take a look at their Sherlock Holmes story (Holmes is now the super 帅 Gao Ming), and you’ll see what I mean . To learn more about why they chose a western classics with a Chinese feel, check out what All Set Learning had to say on its News Feed. All books in Level 1 (above) are “designed around Mandarin Companion’s core set of 300 basic character ensuring that most vocabulary will be simply, everyday words, composed of characters that the learner is most likely to know.” The books also include a Key Words index at the back, and story adaptation notes that help you jump right in to the story. Digital editions are available through Kindle, iBooks, and kobo, and run for $9.95 USD. To find out more, or purchase the books directly from the site here. Word lists for all five stories can be found in the Textbooks section of Vocabulary Lists by searching “Mandarin Companion,” or by clicking the direct links on the book titles listed above. Each word list on Skritter was sorted in a descending order according to highest frequency and divided into 100 word sets. It should be a great way to add more context to your study sessions on Skritter, and increase enjoyment of the stories as you breeze past all the words you’ve just mastered! The Skritter team is glad to help spread the word on these awesome, comprehensible study materials, and are happy to be able to provide our users with these wonderful, high frequency, vocab lists. We hope you enjoy! Have questions or comments? Be sure to leave them below. Until next time, happy skrittering!